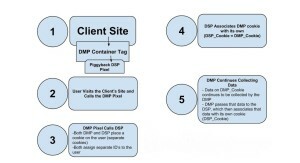 How does cookie sync work between DMP and DSP?Cookie sync is depend on the DMP and DSP. 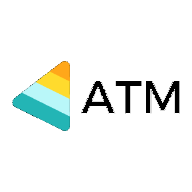 DMP(Data management platform). All data provided to DMP is from data suppliers or they are collecting data on their own.A Data Management Platform (DMP) is a technology platform that collects, stores, and packages the consumer data it receives from various Data Suppliers.Through database integration, DMPs will then make this information available to its various ad technology partners. The client would, through the DMP’s UI, place a pixel from the DSP in the universal container. So now, when a user calls the DMP’s universal container tag on the client’s site, the DMP in turn calls the DSP’s pixel into that universal container. 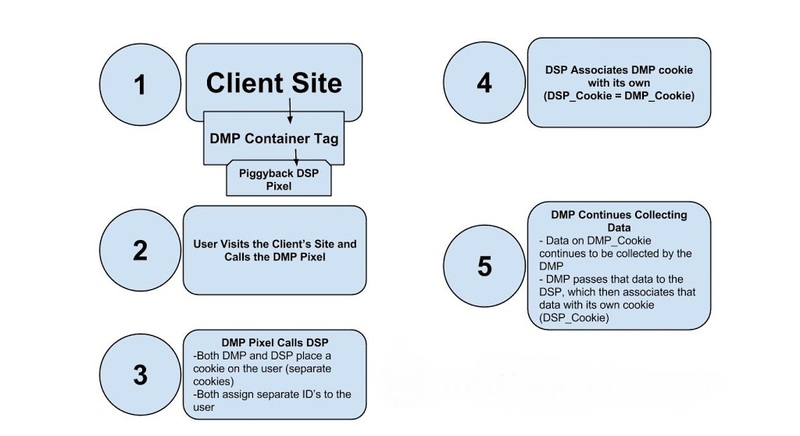 Plainly speaking, a user’s browser on the client’s site receives a cookie from both the DMP and the DSP. The DMP and the DSP can now both assign an ID to that user. Here’s how the sync happens – when the DMP makes that call to the DSP, it also passes its cookie ID to the DSP, usually through a query string. So now the DSP writes the DMP’s cookie ID into its record for the same cookie ID. Now the cookies are synched and the DSP knows that its cookie ID 123 = the DMP’s cookie ID 456. If there is a server-to-server integration, no other information needs to get passed at this time. The DMP goes on collecting information on that cookie ID, and in a nightly, hourly, or other regular process, batches all relevant behavioral information it has about that user (at the client’s discretion and control) to the DSP, which can attribute the data to the correct user because the IDs are synced.